Metabolism is a very important concept one has to understand when trying to get in shape. If you’re trying to trim your middle into slim, here’s what you need to know, and how key botanicals can help you on your weight-loss journey. To simplify, Metabolism related to the body’s internal process of producing energy from fat, sugar and protein. The more energy you produce, the faster your metabolism, and the less energy you produce, the slower your metabolism is. Metabolism is responsible for keeping the body moving like a well-oiled machine. It continuous process and the energy converted from the food you eat allows you to move, to think and for most of your body parts and processes to function properly. Can You Speed Up Metabolism? Eating more calories than you can burn will always be the primary cause behind weight gain. You can “boost” your metabolism by working with it; eat healthy fats and protein, consume less sugar, and incorporate more physical activity into your daily routine. For centuries, herbs and botanicals have been used to naturally treat ailments and aid various bodily functions and processes. 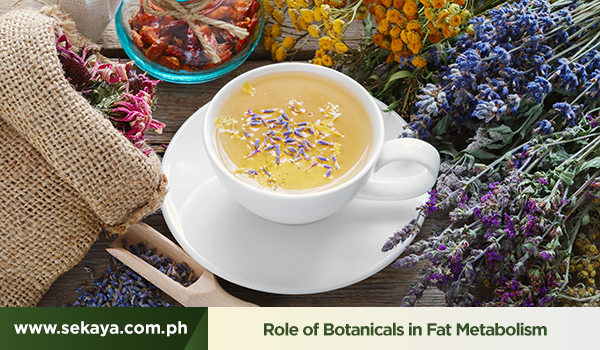 Green tea and Pu-erh are just two of many teas found to have high levels of compounds that naturally block the formation of fat and optimize the body’s metabolism process. caffeine and a compound known as EGCG blasts adipose tissue, in effect releasing fat from fat cells (specifically in the belly area) and speeding up the liver’s capacity to converting the released fat into energy. Experience these effects with every calming infusion of Sekaya Green Earl Grey. With bioactive components theobromin, theaflavins, and complex polysaccharides, Pu-erh tea is consumed as a medicinal beverage for a variety of illnesses. Pu-erh tea also suppresses the conversion of fatty acids into fat, and reduces cholesterol production. Serving suggestion: drink a cup of Sekaya Pu-erh Trim one hour after a meal. Sample nature’s nurture for the body with Sekaya Botanic Infusions.